G protein-coupled receptors (GPCRs) transduce a wide variety of extracellular signals to within the cell and therefore have a key role in regulating cell activity and physiological function. GPCR malfunction is responsible for a wide range of diseases including cancer, diabetes and hyperthyroidism and a large proportion of drugs on the market target these receptors. The three dimensional structure of GPCRs is important for elucidating the molecular mechanisms underlying these diseases and for performing structure-based drug design. Although structural data are restricted to only a handful of GPCRs, homology models can be used as a proxy for those receptors not having crystal structures. However, many researchers working on GPCRs are not experienced homology modellers and are therefore unable to benefit from the information that can be gleaned from such three-dimensional models. Here, we present a comprehensive database called the GPCR-SSFE, which provides initial homology models of the transmembrane helices for a large variety of family A GPCRs. Extending on our previous theoretical work, we have developed an automated pipeline for GPCR homology modelling and applied it to a large set of family A GPCR sequences. Our pipeline is a fragment-based approach that exploits available family A crystal structures. The GPCR-SSFE database stores the template predictions, sequence alignments, identified sequence and structure motifs and homology models for 5025 family A GPCRs. Users are able to browse the GPCR dataset according to their pharmacological classification or search for results using a UniProt entry name. It is also possible for a user to submit a GPCR sequence that is not contained in the database for analysis and homology model building. The models can be viewed using a Jmol applet and are also available for download along with the alignments. The data provided by GPCR-SSFE are useful for investigating general and detailed sequence-structure-function relationships of GPCRs, performing structure-based drug design and for better understanding the molecular mechanisms underlying disease-associated mutations in GPCRs. The effectiveness of our multiple template and fragment approach is demonstrated by the accuracy of our predicted homology models compared to recently published crystal structures. Due to their fundamental role in signal transduction, G protein-coupled receptors (GPCRs) are the target of a large proportion of medical drugs. GPCR structural data are important for understanding the molecular mechanisms underlying diseases caused by mutations in these receptors, as well as for structure-based drug design. Up until November 2010, experimentally determined three-dimensional structures of family A GPCRs were only available for four members - see Topiol and Sabio  for a review of these structures. This is in stark contrast to the total number of family A GPCRs, which for humans alone has recently been estimated at 750 receptors . All of the family A GPCR structures share a common molecular architecture of seven transmembrane helices (TMHs), therefore the deficit in GPCR experimental structures can be rectified by building molecular models of GPCRs of unknown structure using homology modelling techniques . Currently, there are seven different GPCR structures to choose from when building homology models of GPCRs in the inactive state: bovine rhodopsin (Swiss-Prot:opsd_bovin) ; Japanese flying squid rhodopsin (Swiss-Prot:opsd_todpa) [5, 6]; common turkey beta-1 adrenergic receptor (Swiss-Prot:adrb1_melga) ; human beta-2 adrenergic receptor (Swiss-Prot:adrb2_human) [8, 9]; human adenosine receptor A2A (Swiss-Prot:aa2ar_human) ; human dopamine D3 receptor (Swiss-Prot:drd3_human)  and human CXCR4 chemokine receptor (Swiss-Prot:cxcr4_human) . However, despite the common general architecture of these structures, key differences do exist between them. The choice of which experimental GPCR structure(s) to use for building a comparative model of a particular GPCR is unclear and without detailed structural and sequence analyses, could be arbitrary. In order to help clarify the choice of template selection for GPCR homology modelling, we recently developed a workflow for identifying the most appropriate template to use for building homology models of family A GPCRs . We analyzed in detail conserved and unique sequence motifs and structural features in the five experimentally-determined GPCR structures available at the time. Our analysis provided deeper insight into specific and important structural features of GPCRs and valuable information for template selection. Using key features, we formulated a workflow for identifying the most appropriate template(s) for building homology models of GPCRs of unknown structure. Our analysis revealed that the available crystal structures represent only a subset of all possible structural variation in family A GPCRs. Some GPCRs have structural features that are distributed over different crystal structures or which are not present in the templates, suggesting that homology models should be built using a fragment approach whereby template selection is carried out for each TMH, rather than the receptor as a whole. There are a number of web resources available which focus on GPCRs. The IUPHAR database of GPCRs provides a comprehensive catalogue of peer-reviewed pharmacological, chemical, genetic, functional and anatomical information on human, rat and mouse nonsensory GPCRs, as well as links to other relevant resources . 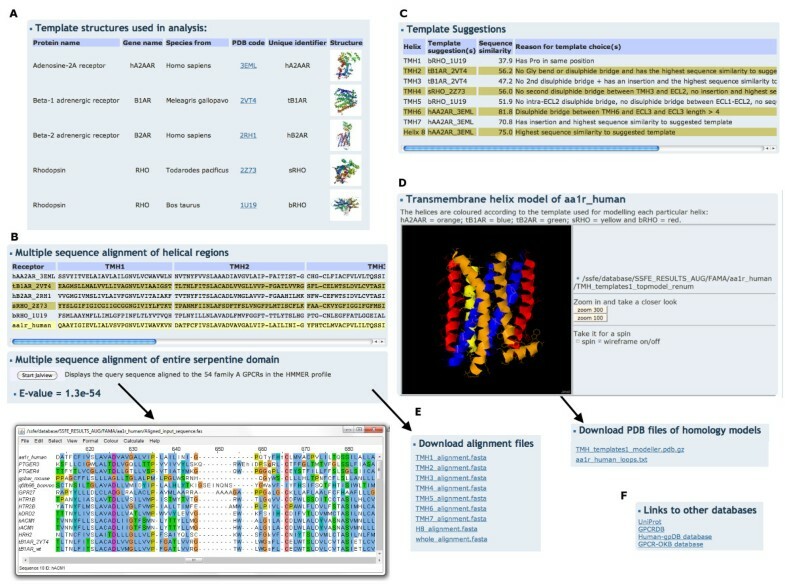 The GPCRDB is an online information system for GPCRs which provides multiple sequence alignments, mutation data, ligand binding data and various tools such as an alignment builder and predicting the effects of mutations . Interactions between human GPCRs, G proteins and effectors can be visualized using human-gpDB  whilst GPCR oligomer information is provided by GPCR-OKB . Where structural data are provided by the aforementioned resources, they are limited to the handful of GPCRs with crystal structures available. The specialized GPCR databases SSFA  and GRIS  provide homology models of GPCRs, although these are restricted to the three glycoprotein hormone receptors. Zhang and co-workers used their threading assembler refinement method to build molecular models of 907 human GPCRs . Although the models are available for download, they are currently not stored in a database and they were generated at a time when only the structure of bovine rhodopsin was available. We have now extended our previous theoretical work and automated our workflow and applied it to a set of 5025 family A GPCR sequences. Based on these automated template suggestions, homology models were built of the seven TMHs and helix 8 of the 5025 receptors. Here, we present the GPCR-Sequence Structure Feature Extractor (SSFE) database, which stores the template predictions, the identified sequence and structure motifs and homology models of 5025 family A GPCRs. 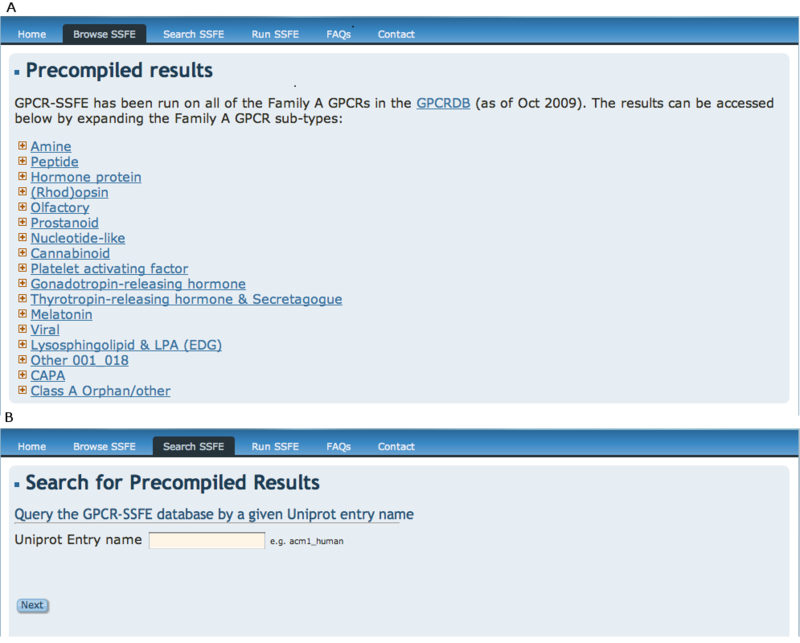 Users are able to browse the GPCR dataset stored in GPCR-SSFE or search for results using a UniProt entry name . It is also possible for a user to submit a GPCR sequence that is not contained in the database for analysis, with the template suggestions for the seven TMHs and helix 8 returned along with a molecular model. The molecular models presented in GPCR-SSFE represent the most comprehensive set of GPCR models created so far and offer a valuable starting point for in silico functional predictions, docking studies and structure-based drug design. GPCR-SSFE contains all family A GPCRs sequences that were stored in the GPCRDB as of October 2009, totalling 5025 receptors . A profile hidden markov model (HMM) was used to align the 5025 GPCRs to the five template structures available at the time (before November 2010) (PDB codes: 1U19, 2Z73, 2VT4, 2RH1 and 3EML) . HMMER2 http://hmmer.janelia.org/ was used to generate the profile HMM from a multiple sequence alignment (MSA) of the five templates plus 54 other family A GPCRs (see additional file 1 for a list of the GPCRs used to produce the HMM). The 54 GPCRs were selected so as to maximize the coverage of the phylogenetic tree for family A GPCRs . After alignment, template selection was carried out for each TMH and helix 8 based on our previously published workflow , which for the purposes of this work was automated using python scripts. The workflow uses the presence or absence of structural features such as proline distortions, disulphide bridges and insertions as well as sequence similarity comparisons to select the best template(s) for modelling a given GPCR. Modeller 9v7 was used to generate homology models of query GPCRs using the alignments and templates suggested by GPCR-SSFE . Three models were produced for each GPCR but only the one with the lowest DOPE score  is stored in GPCR-SSFE. 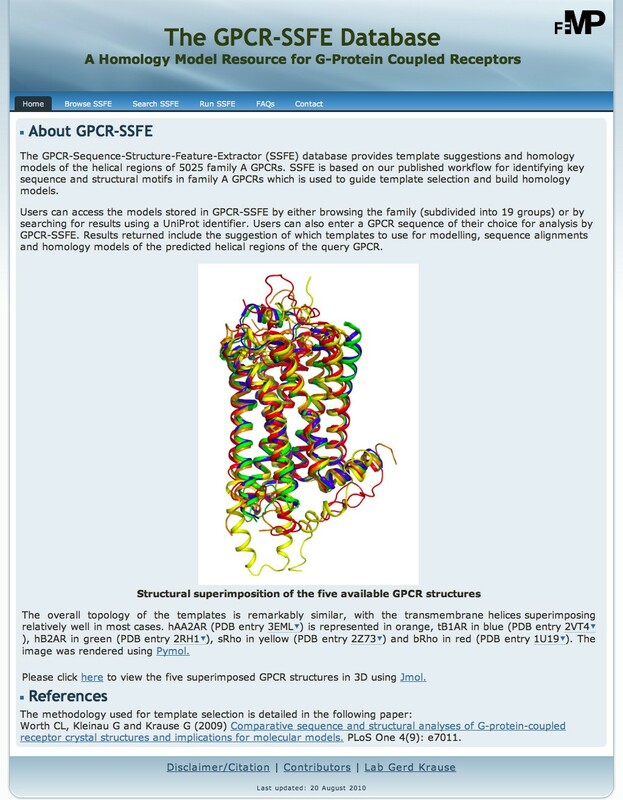 The GPCR-SSFE has a user-friendly interface with a menu and a facts and questions (FAQ) page to aid usability. On the homepage of GPCR-SSFE (Figure 1), users can find information about the database and the template structures used for analysis and homology modelling, including a link to a Jmol applet showing the five template structures superimposed onto one another (Figure 2). The home page of the GPCR-SSFE database. The menu at the top of the page allows users to easily navigate the site. The background to the database is provided, along with information about the templates used for homology modelling. Structural superimposition of the GPCR template structures. Users can access a Jmol applet displaying the five crystal structures used for analysis and homology modelling via the home page. Results can be retrieved by either browsing or searching the database. By navigating to the "Browse SSFE" menu option, the user is presented with a list of 19 family A GPCR subgroups (Figure 3A): Amine, Peptide, Hormone protein, (Rhod)opsin, Olfactory, Prostanoid, Nucleotide-like, Cannabinoid, Platelet activating factor, Gonadotropin-releasing hormone, Thyrotropin-releasing hormone & Secretagogue, Melatonin, Viral, Lysophingolipid & LPA (EDG), Leukotriene B4 receptors, Ecdysis triggering hormone receptor, Other, CAPA and Class A orphan/other. These subgroups correspond to those used in the GPCRDB and are based on the pharmacological classification of GPCRs. Each subgroup can be expanded by clicking on it, revealing either further subgroupings or (if the final node is reached) a list of GPCRs within the subgroup. Clicking on the UniProt entry name of a GPCR will take the user to the results page for that particular receptor. Alternatively, users may retrieve results by entering the UniProt entry name onto the "Search SSFE" webpage (Figure 3B). Querying the GPCR-SSFE database. Results may be retrieved from the database by either A) browsing the database via a list of 19 family A GPCR subgroups or B) by searching using a UniProt entry name. The results returned by GPCR-SSFE include (Figure 4): i) the templates used for analysis and links to the PDB ; ii) the multiple sequence alignment (MSA) of the five templates and the query sequence for each individual transmembrane helix and helix eight; iii) the MSA of the profile HMM GPCR sequences and the query sequence, which spans the entire serpentine domain; iv) the HMMER2 e-value assigned to the full-length MSA; v) the template suggestions (and reasons) for the seven TMHs and helix eight; vi) the sequence similarity score between the suggested template(s) and the query sequence; vii) the rationale for the suggested templates; viii) a Jmol applet displaying the homology model(s) of the query GPCR based on the template suggestions; ix) the amino acid sequences of the intracellular and extracellular loops and x) links to UniProt, the GPCRDB and, where applicable, to the Human-gpDB and GPCR-OKB databases. The loops are not modelled and therefore the loop sequences are provided to the user so that software such as SuperLooper may be used for modelling these regions . Files containing results ii, iii, viii and ix are made available for download (Figure 4E). Additionally, for stereochemical quality checking a PROCHECK  generated Ramachandran plot of each model is provided and information about how to interpret the results are provided on the FAQ page. GPCR-SSFE template prediction and homology model results. Results are shown for adenosine receptor A1 and include A) the templates used for analysis and links to the PDB; B) the multiple sequence alignments of the individual helices and the alignment spanning the entire serpentine domain; C) The template predictions, sequence similarity scores and prediction reasons; D) A Jmol applet displaying the homology model of the query GPCR; E) Downloadable files of the alignments, loops and homology model and F) links to entries in other relevant databases. In some instances, GPCR-SSFE might not store results for particular family A GPCRs e.g. newly identified orphan GPCRs. For such cases, users can submit their GPCR sequence (in FASTA format) to GPCR-SSFE for analysis and homology model building by navigating to the "Run SSFE" webpage (Figure 5). Modeller 9v7 is used for homology modelling, therefore, users must obtain a Modeller license key before they can use this tool. This key is freely available for academic users and easily obtainable at: http://salilab.org/modeller/registration.shtml. 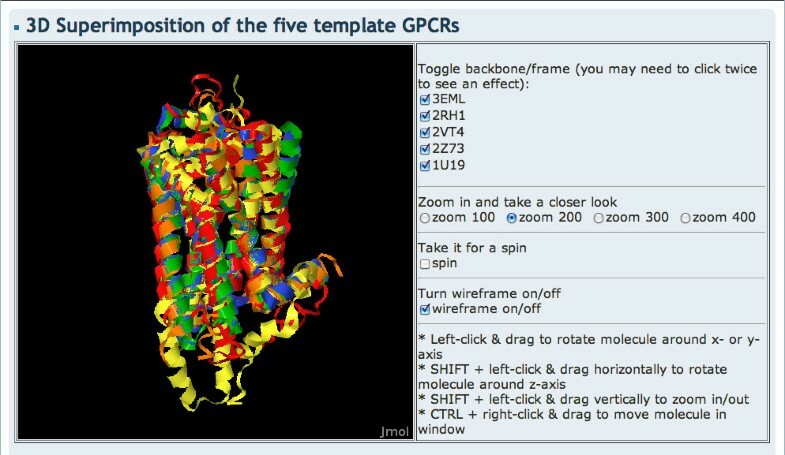 To start the template analysis and homology modelling, the user enters their GPCR sequence onto the webpage (by either uploading or copying and pasting it), along with their Modeller licence key and email address. Once the results are ready, a web-link is emailed to the user. Results are stored on the server for seven days. The results page looks exactly like those retrieved when searching the database, except that links to external databases are not provided. GPCR-SSFE sequence submission page. Where a family A GPCR is not contained in the database, a user may submit their sequence of interest to GPCR-SSFE for template prediction and homology modelling. Users must obtain a licence key for Modeller before they are able to use this function. Finally, we used I-TASSER , which was ranked 1 in the server category of the Critical Assessment of Structure Prediction (CASP) 2007-2009, to build a model of both drd3_human and cxcr4_human, excluding their respective crystal structures from template selection. For steps 1 to 4, three models were produced using Modeller 9v7 with the model having the lowest DOPE score selected for further accuracy analysis. I-TASSER produces five models and provides a confidence score (C-score) to indicate the likely best model. Therefore, we chose the I-TASSER model with the highest C-score for further accuracy analysis. The accuracy of the models generated using the different template sets and methods above were assessed by calculating the RMSD between the C-α residues in the transmembrane region using the align feature of Pymol (Table 1). Unsurprisingly, the results indicate that where multiple templates are used, the addition of more similar templates improves the models e.g. models produced using the two rhodopsin templates (lowest sequence similarity templates to the two targets) had higher RMSDs than the models produced using all five templates. The use of multiple templates compared to a single template produces fairly similar RMSDs, although the multiple template model produced for drd3_human is slightly better than that produced using the single closest template (0.88Å compared to 0.94Å). Furthermore, where the full number of templates are used for modelling with GPCR-SSFE, the model produced for drd3_human is similar in accuracy to that produced by I-TASSER and better than I-TASSER in the case of cxcr4_human. We also did a comparable analysis of the five template structures and observed similar results to those observed for drd3_human and cxcr4_human, although in some instances the models produced by I-TASSER are significantly worse due to part of the transmembrane domain being modelled on the T4 lysozyme insertion found in some GPCR crystal structures (See additional file 2, Tables S1-S5). These results validate the effectiveness of the multiple template and fragment approach to homology model building employed by SSFE and indicate that the models are as accurate and, in some cases, better than those produced by one of the current best performing homology modelling programs (as measured by the CASP ). We plan to incorporate these two new structures to GPCR-SSFE's workflow and pool of available templates in the very near future and then re-run the template analysis and model building for the 5025 GPCRs in the database. Our results show that the addition of more similar templates improves the quality of the models and that the single template generated models are similar or slightly worse than the multiple template models. Finally, our results demonstrate that the models produced for the human CXCR4 chemokine receptor and the human dopamine D3 receptor are native like, having RMSDs compared to their crystal structures of 1.7 and 0.9 respectively. A recent study demonstrated that automated modelling of human neurokinin-1 receptor was enriched by a factor of 2.6 when a combination of bovine rhodopsin and beta-2 adrenergic receptor were used as templates rather than when used singly . Similarly, Mobarec and coworkers found that the use of multiple templates can provide similar or slightly improved models of the transmembrane regions of GPCRs compared to receptor models obtained using single templates . Although a modelling study on opioid receptors demonstrated that it is not always true that a GCPR homology model built using multiple templates is structurally better than those built using one . Our approach to building homology models of GPCRs has a number of advantages over other recent similar studies. Firstly, GPCR-SSFE uses all available family A GPCR templates (that were available at the time of performing the work) to estimate all of the sequence related structural features for a particular receptor and to generate an optimal GPCR model. Secondly, the template for each transmembrane helix is selected individually, meaning that either a single template or a fragment-based approach can be used for model building. This is an important feature considering that it has been shown that sometimes models that are built using one template are better than those built using multiple templates, whereas at other times multiple template models are better [31, 32]. Thirdly, GPCR-SSFE has been applied to a very large set of family A GPCRs and all of the homology models have been made available for download and stored in a database. The availability of these initial models allows researchers who are not experienced homology modellers to access three-dimensional data of GPCRs that they are interested in. The user should be aware however, that some GPCR sequences lack particular motifs that are responsible for structural features and which currently occur in all of the available templates, for example, the helix bulges caused by prolines in TMH 5. Since the prolines and bulges are present in all of the templates, they also subsequently occur in the homology models, even when a proline is not present in the corresponding position in a target sequence. Thus, in such cases further refinement of the initial model may be required. Due to their variability in sequence, length and conformational flexibility, the loop regions of GPCRs are far more difficult to predict by both homology modelling and de novo modelling techniques [34, 35]. Based on their dockings studies on human beta-2 adrenergic receptor, Mobarec and coworkers speculate that GPCR models without loops may constitute a better alternative for flexible ligand-rigid protein docking than those with loops . Therefore, although the models built using GPCR-SSFE are loopless, we are confident that they will be extremely useful for i) investigating the mechanisms underlying structural and/or functional effects of mutations; ii) performing docking studies and iii) structure-based drug design. Nevertheless, the provided initial models can be completed by building the loops with suitable software tools . Our previous analysis indicates that, in general, the structural features of target GPCRs cannot be captured using only one of the experimental GPCR structures as a template for homology modelling. Consequently, we suggest that using transmembrane fragments from multiple templates when building comparative models of GPCRs is likely to lead to more accurate results, an approach that has also been advocated by other published studies on molecular modelling of GPCRs [3, 20]. GPCR-SSFE is the first comprehensive GPCR-focused database to store homology models based on the crystallographic advances made in recent years. The fragment-based models stored in GPCR-SSFE serve as a valuable starting-point for molecular analyses of GPCRs based on their structure, such as structure-based drug design or the detailed molecular analysis of mutations. We believe that GPCR-SSFE will be of increasing importance as more crystal structures become available because the problem of template selection will become more complex. GPCR-SSFE is freely available for use on the web at: http://www.ssfa-7tmr.de/ssfe/. The database is publicly and freely accessible, requiring no registration and with no restrictions on use. 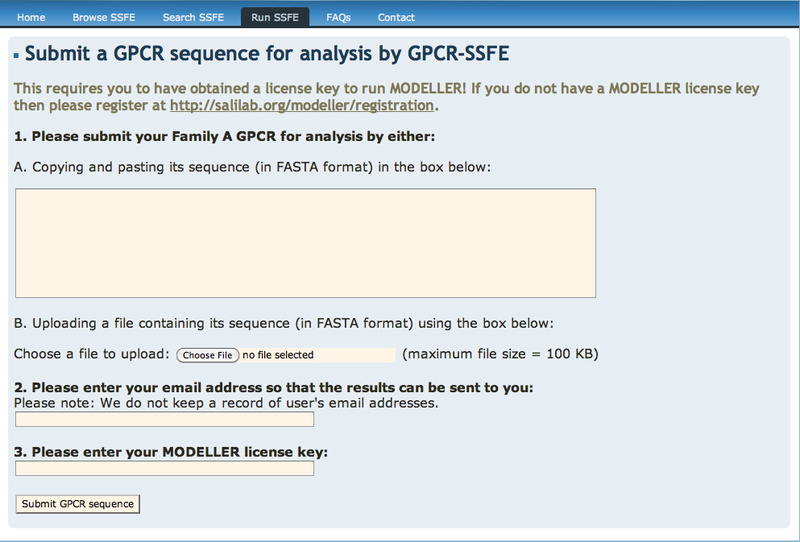 The GPCR-SSFE server tool requires users to have a Modeller license key, which can be easily and quickly obtained by academic users at the Modeller website http://www.salilab.org/modeller/registration.html. This work was supported by a DAAD Kurt Hahn research grant to CLW. CLW performed the algorithm development, homology modelling, designed the database, developed the web interface and wrote the manuscript. AK implemented the search function. CLW and GKr conceived of the study. AK, GKr and GKl conducted the testing. All the authors read and approved the final manuscript.